The final results of the project BabyLux were delivered and discussed during a public conference at Politecnico di Milano, Milan, Italy on April 28, 2017. For the first time, two advanced biophotonic technologies – near-infrared time-resolved spectroscopy (TRS) and diffuse correlation spectroscopy (DCS) – have been combined and the already tested prototypes were extended to the level of demonstrators. 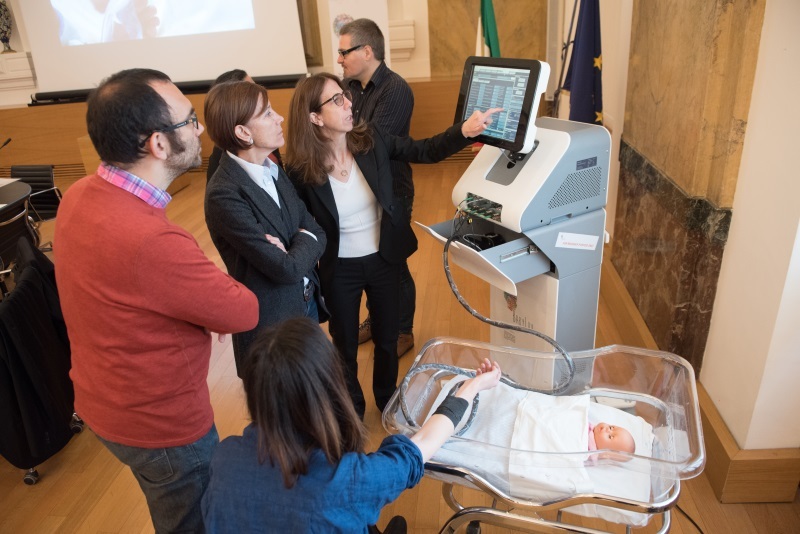 Two devices were installed and used by doctors for six months in the neonatology units at the Rigshospitalet in Copenhagen, Denmark and at the Fondazione IRCCS Ca’ Granda - Ospedale Maggiore Policlinico in Milan, Italy. The project goal is to reduce the risk of brain lesions in extremely preterm babies. The core opto-electronic components necessary for this novel instrument are provided by the German company PicoQuant, a leading provider of instrumentation for single photon counting applications. The first results obtained in the framework of the European project BabyLux are encouraging. As a part of the protocol, 60 measurements have been performed with 35 babies enrolled during their first days of life at the two centers. The technology developed in this project allows continuous and non-invasive monitoring of brain perfusion and oxygenation, which is still lacking on the market. The device is safe with regards to acute adverse reactions, can be brought to the bedside, and allows for continuous monitoring, both under critical and non-critical conditions, as each measurement takes only a few minutes. This first trial phase was focused on the evaluation of test/re-test variability as a precision benchmark. The tests revealed that moving the sensor from one site to another on the head resulted in a variability of less than 5% in microvascular blood oxygenation values and in a 15 to 25% variability in microvascular cerebral blood flow indexes. These values are better than or comparable with currently existing commercial devices. The goal of BabyLux is to reduce the risk of brain lesions in extremely preterm babies and thus prevent disabilities in such children by controlling the clinical parameters affecting their cerebral status with a high level of accuracy. According to the last the Global Action Report published by The World Health Organization, 13 million births every year are preterm. The clinical protocol has been authorized by both the Danish Medical Agency and the Italian Ministry of Health. The next step involves applying this novel monitoring technology to more preterm babies in order to consolidate the clinical research as well as design and implement new studies and clinical trials to foster its use in clinical care. The BabyLux project was carried out by an international consortium involving the Politecnico di Milano, the Fondazione Politecnico di Milano, the ICFO-Institute of Photonic Sciences, the Fraunhofer Institute for Production Technology IPT, Hemophotonics SL, PicoQuant GmbH, the strategy consultancy Loop Unique Companies, Capital Region, and the Fondazione IRCCS Ca' Granda - Ospedale Maggiore Policlinico. The consortium proposed and developed an innovative technique for detecting and monitoring the brain oxygenation and perfusion state of newborns in a non-invasive and accurate way. The three year project concluded in April 2017 and was partially funded by the European Commission under the ICT Policy Support Programme (ICT PSP) as part of the Competitiveness and Innovation Framework Program.